Let users destroy trees by breaking only 1 log. Even the biggest tree will fall! Also destroys all leaves around. Auto-replant. Replanted saplings can be automatically protected so they cannot be broken until they grow a tree. Switch on/off if an axe is required. (Not implemented yet) If so, axes are damaged in consequence. (Not implemented yet) Proper protection in WorldGuard areas. /tc update: Checks for new updates, and updates if able. /tc reload: Reload config.yml changes. /tc setreplant <true/false>: Sets if trees should be replanted. /tc setinvinciblereplant <true/false> (not implemented yet): Sets if replanted saplings should be unbreakable by survival players. /tc setvipmode <true/false>: Sets if vip mode is on. cristreecapitator.user: Always required to take down trees fast. cristreecapitator.admin: Required to change options by commands. cristreecapitator.vip: Required to take down trees fast when Vip Mode is enabled. You may configure the plugin just the way you want, using either commands or editing the config file, then typing /tc reload. Enable vip mode (/tc setvipmode true). Give 'cristreecapitator.vip' permission node to VIP players. It's already done! 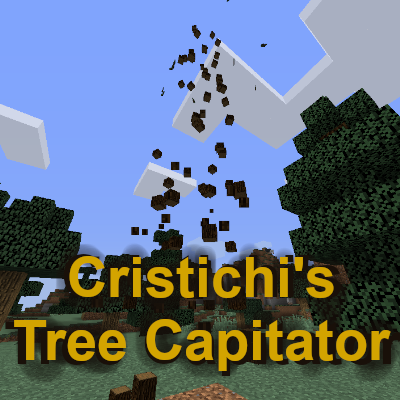 VIP players will be the only ones allowed to cut down trees using Cristichi's Tree Capitator! There is no way for anyone to make a difference, except for one that will lag the server a lot. Make sure to enable "axe needed" in the config file so you can punch blocks to break them without breaking any other ones. Hope it helps. Hey man plugin is looking really great! I have a suggestion of giving us the option to turn off the "tree feller" type option. So basically allowing us to just chop the tree down normally.. I need this option for my prison server I'm building. Also I am excited to have the WorldGuard protection working because that will work best for my prison server as well! Thanks for your interest! But the lastest build includes an option that makes the plugin only work when the user uses an axe to break the log. Also, before starting WorldGuard support I first want to implement the replanting protection. I'll get to work! Replanting protection seems to be working for me. Cheers! 10/10. We need more people like this guy. @cristichi, Could you please compile this against the current stable/production release of Java, which is also the only version still available with both 64 AND 32 bit machine support(particularly on windows)? This will ensure maximum compatibility for production servers, while still being supported by newer builds. It's also worth noting that by default, Minecraft is bundled with 1.8.0_51. While this doesn't specifically relate to running a server, it's still relevant for consistency sake. would you consider releasing the source for your plugin, so others can keep building it at the production release rather than the latest? If this is going to be a regular issue, I'll have to look at other potential plugins that do a similar job. Latest file isn't installing when I drag into the plugins folder for some reason. I reinstalled java on my computer and also tried uninstalling java completely. I think the java version of the server files I'm using might be the problem, but I'm not sure how to update it.